RFL/RE – About a year ago, Iran blocked the highly popular messaging app Telegram, an encrypted tool that half the country’s 81 million people used for sharing news and information, debating in private, and conducting business. But polling cited by official media and an embarrassing gaffe on state TV suggest that the clerically dominated leadership’s policies on social media and other digital platforms might be missing their mark. 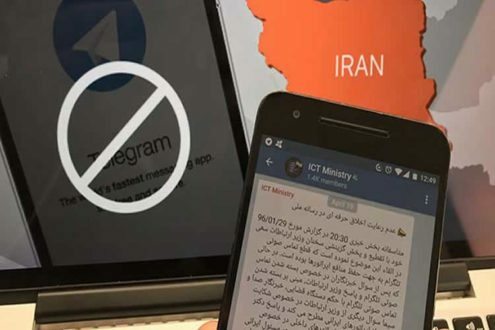 ​Recent figures from the Tehran-based Iranian Student Polling Agency (ISPA) and quoted by local media including government news agency IRNA suggest that Telegram is again the country’s most popular app, with a tool that authorities have threatened to ban, Instagram, in second. RFE/RL journalists cannot access the ISPA’s proprietary research. “Filtering could not prevent people from [using] Telegram,” IRNA wrote alongside an April 7 graphic of the ISPA’s findings. Such policies remain a target of Tehran critics — including U.S. Special Representative for Iran Brian Hook in an opinion piece this week in The New York Times — who accuse it of bifurcating Iranian society into information haves and have-nots, with bans enforced against average citizens but ignored when the offenders are political or religious elites. “Excuse me, sir, but Telegram has been filtered,” the moderator responds as he bursts into laughter. Seemingly recognizing his verbal slip, the cleric quickly says he was of course referring to “that time” and jokes that his Telegram was not filtered. Iranians use Telegram to access and share uncensored news and information and content deemed sensitive by Iran’s postrevolutionary regime. But they also use it to stay in touch with friends and relatives at home and abroad, engage in debates and conduct advertising and business. The indefinite filtering of Telegram on the grounds that it endangered national security was ordered by Iran’s hard-line Judiciary in May 2018 amid a state push for Iranians to use homegrown messaging apps. But the economic daily Donya-e Eghtesad reported recently that 2 percent of Iran’s social-media users have joined Soroush. Iran’s official media outlets also stopped posting on their Telegram channels while joining homegrown apps. The official website of Iran’s government also has a Telegram channel. Khamenei’s Telegram channel remains inactive.